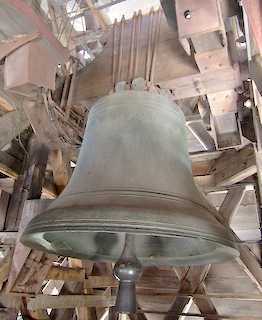 The great bourdon bell, called Emmanuelle, is located in the South Tower at Notre Dame in Paris. It is the largest of five great bells at the cathedral. It is rung to mark the hours of the day and on special occasions. The bells were once rung manually, but are currently rung by electric motors, when it was discovered that the size of the bells could cause the entire building to vibrate, which threatened its integrity. Weight of the bell’s clapper: 500 Kg. Conclusion: Emmanuelle weighs more than me. She can be heard throughout the city of Paris which means that the bell is not only heavier than me, but has the rare honor of being louder than me too.